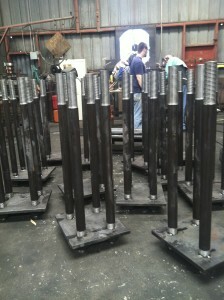 Atlanta Rod manufactures custom embedments to your specifications. We produce studded pipe, embed plates of all shapes and sizes, embedded angles and channels, and do miscellaneous steel fabrication for sump screens, diamond plate, etc. Our in-house CAD drafting personnel can detail concrete embeds for engineering approval on your construction project. Concrete embeds can be manufactured immediately and coated for shipment.